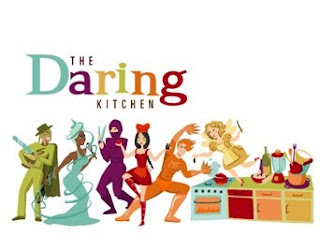 Anyhow, it is with great joy that I write about the February 2010 Daring Bakers’ challenge which is hosted by Aparna of "My Diverse Kitchen" and Deeba of "Passionate About Baking". They chose "Tiramisù" as the challenge for the month. Their challenge recipe is based on recipes from The Washington Post, "Cordon Bleu At Home" and Baking Obsession. As I am a big "Tiramisù" fan and I love testing different recipes, Aparna and Deeba's choice could not have made me more happy. My excitment was also multiplied by the prospect of trying my hand for the very first time at baking "Ladyfingers" and making my own "Mascarpone Cheese". Awesome! "Tiramisù" is one of the most popular desserts/cakes hailing from Italy. It is composed of light, crispy and sweet Génoise cake-like biscuits called "Ladyfingers" (or "Savoiardi") which are dipped in espresso or strong coffee or rum, a whipped mixture made with egg yolks, mascarpone cheese, sugar and is sprinkled with cocoa. This kind of pudding is somehow comparable to the French "Charlotte" or the English "Trifle". The origins of "Tiramisù" are not very clear as there is no documented mention of the dessert before 1983. Some think that it is a recent invention. Apparently, "Tiramisù" was created in 1971 in Treviso by Giuseppe Di Clemente. Several sources claim that "Tiramisù" was invented in Treviso at Le Beccherie restaurant by the god-daughter and apprentice of confectioner Roberto Linguanotto, Francesca Valori, whose maiden name was Tiramisu. It is believed that Linguanotto named the dish in honour of Francesca's culinary skill. Then, other sources report the creation of the cake to have originated in the city of Siena in honour of Cosimo III on the occasion of his visit to the city. Alternatively, accounts by Carminantonio Iannaccone as researched and written about by The Washington Post and Baltimore Magazine establish the creation of "Tiramisù" by him on December 24, 1969, in Via Sottotreviso while he was head chef at Treviso, near Venice. Although the "Tiramisù" was extremely unphotogenic (very difficult to unmold cleanly, thus looking somewhat like a "dog's dinner" and only wanted to lean dangerously on one side like the Tower of Pisa), it was nonetheless a real success once it hit our palates. The taste of that dessert is just divine and it's texture is heavenly. All the aromas blend perfectly together in order to create a sweet symphony of flavors that'll blow your brains out. 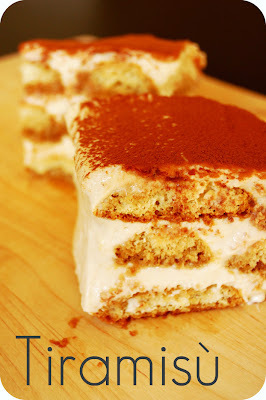 That "Tiramisù" dissolves without chewing and is so silky, smooth, creamy, fluffy, spongy in texture. Orgasmically luscious! Many thanks to Aparna & Deeba for making me discover a different version of that Italian speciality and for intriducing me to the art of homemade "Mascarpone Cheese" and "Ladyfingers". Makes one 20 x 20cm (8 x 8 inch) Tiramisù or 6 servings. Tiramisu is made up of several components which can be made separately and ahead of time and put together the day before serving. Making tiramisu from scratch requires about 2 to 3 days (including refrigeration) from when you start making the mascarpone to the time the tiramisu is served. So this challenge requires some prior planning. Please read the instructions as you need to begin making the mascarpone at least a day in advance. The zabaglione & pastry cream also need 4 hours to an overnight for chilling, as does the main dessert.The flavours mature after an overnight rest, and the dessert can be kept refrigerated for 2-3 days. Once assembled, the tiramisu can be frozen till you need to serve it, in case you are not serving it immediately. 1. Heat water in a double boiler (If you don’t have a double boiler, place a pot with about an inch of water in it on the stove. Place a heat-proof bowl in the pot making sure the bottom does not touch the water). 2. In a large mixing bowl (or stainless steel mixing bowl), mix together the egg yolks, sugar, the Marsala (or espresso/ coffee), vanilla extract and lemon zest. Whisk together until the yolks are fully blended and the mixture looks smooth. 3. Transfer the mixture to the top of a double boiler or place your bowl over the pan/ pot with simmering water. Cook the egg mixture over low heat, stirring constantly, for about 8 minutes or until it resembles thick custard (It may bubble a bit as it reaches that consistency). 4. Let cool to room temperature and transfer the zabaglione to a bowl. Cover and refrigerate at least 4 hours or overnight, until thoroughly chilled. 1. Mix together the sugar, flour, lemon zest and vanilla extract in a medium heavy-bottomed saucepan. To this add the egg yolk and half the milk. Whisk until smooth. 2. Now place the saucepan over low heat and cook, stirring constantly to prevent the mixture from curdling. Add the remaining milk a little at a time, still stirring constantly (After about 12 minutes the mixture will be thick, free of lumps and beginning to bubble. If you have a few lumps, don’t worry. You can push the cream through a fine-mesh strainer). 3. Transfer the pastry cream to a bowl and cool to room temperature. Cover with plastic film and refrigerate at least 4 hours or overnight, until thoroughly chilled. 1. Combine the cream, sugar and vanilla extract in a mixing bowl. 2. Beat with an electric hand mixer or immersion blender until the mixture holds stiff peaks. Set aside. 1. Have ready a rectangular serving dish (about 8" by 8" should do) or one of your choice. 2. Mix together the warm espresso, rum extract and sugar in a shallow dish, whisking to mix well. Set aside to cool. 3. In a large bowl, beat the mascarpone cheese with a spoon to break down the lumps and make it smooth (This will make it easier to fold). 4. Add the prepared and chilled zabaglione and pastry cream, blending until just combined. 5. Gently fold in the whipped cream. Set this cream mixture aside. 6. Now to start assembling the tiramisu. Workings quickly, dip 12 of the ladyfingers in the sweetened espresso, about 1 second per side. They should be moist but not soggy. 7. Immediately transfer each ladyfinger to the platter, placing them side by side in a single row (You may break a lady finger into two, if necessary, to ensure the base of your dish is completely covered). 8. Spoon one-third of the cream mixture on top of the ladyfingers, then use a rubber spatula or spreading knife to cover the top evenly, all the way to the edges. 9. Repeat to create 2 more layers, using 12 ladyfingers and the cream mixture for each layer. 10. Clean any spilled cream mixture; cover carefully with plastic wrap and refrigerate the tiramisu overnight. 11. To serve, carefully remove the plastic wrap and sprinkle the tiramisu with cocoa powder using a fine-mesh strainer or decorate as you please. 12. Cut into individual portions and serve. 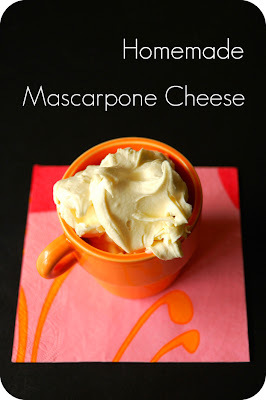 This recipe makes 12oz/ 340gm of mascarpone cheese. 1. Bring 1 inch of water to a boil in a wide skillet. Reduce the heat to medium-low so the water is barely simmering. 2. Pour the cream into a medium heat-resistant bowl, then place the bowl into the skillet. Heat the cream, stirring often, to 190 F/87° C (If you do not have a thermometer, wait until small bubbles keep trying to push up to the surface). It will take about 15 minutes of delicate heating. 3. Add the lemon juice and continue heating the mixture, stirring gently, until the cream curdles (Do not expect the same action as you see during ricotta cheese making. 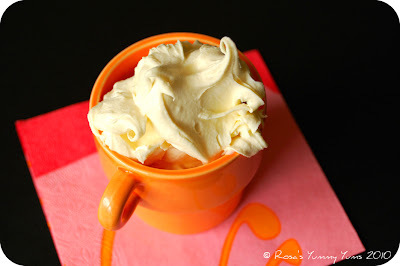 All that the whipping cream will do is become thicker, like a well-done crème anglaise. It will cover a back of your wooden spoon thickly. You will see just a few clear whey streaks when you stir). 4. Remove the bowl from the water and let cool for about 20 minutes. 5. Meanwhile, line a sieve with four layers of dampened cheesecloth and set it over a bowl. Transfer the mixture into the lined sieve (Do not squeeze the cheese in the cheesecloth or press on its surface. Be patient, it will firm up after refrigeration time). 6. Once cooled completely, cover with plastic wrap and refrigerate (in the sieve) overnight or up to 24 hours. The first time I made mascarpone I had all doubts if it’d been cooked enough, because of its custard-like texture. Have no fear, it will firm up beautifully in the fridge, and will yet remain lusciously creamy. 1. Preheat your oven to 350° F (175° C) degrees, then lightly brush 2 baking sheets with oil or softened butter and line with parchment paper. 2. Beat the egg whites using a hand held electric mixer until stiff peaks form. 3. Gradually add granulate sugar and continue beating until the egg whites become stiff again, glossy and smooth. 4. In a small bowl, beat the egg yolks lightly with a fork and fold them into the meringue, using a wooden spoon. 5. Sift the flour over this mixture and fold gently until just mixed (It is important to fold very gently and not overdo the folding. Otherwise the batter would deflate and lose volume resulting in ladyfingers which are flat and not spongy). 6. Fit a pastry bag with a plain tip (or just snip the end off; you could also use a Ziploc bag) and fill with the batter. Pipe the batter into 5"/12.5cm long and 3/4"/2cm wide strips leaving about 1"/2.5cm space in between the strips. 7. Sprinkle half the confectioner's sugar over the ladyfingers and wait for 5 minutes (The sugar will pearl or look wet and glisten). Now sprinkle the remaining sugar (This helps to give the ladyfingers their characteristic crispness). 8. Hold the parchment paper in place with your thumb and lift one side of the baking sheet and gently tap it on the work surface to remove excess sprinkled sugar. 9. Bake the ladyfingers for 10 minutes, then rotate the sheets and bake for another 5 minutes or so until the puff up, turn lightly golden brown and are still soft. 10. Allow them to cool slightly on the sheets for about 5 minutes and then remove the ladyfingers from the baking sheet with a metal spatula while still hot, and cool on a rack. 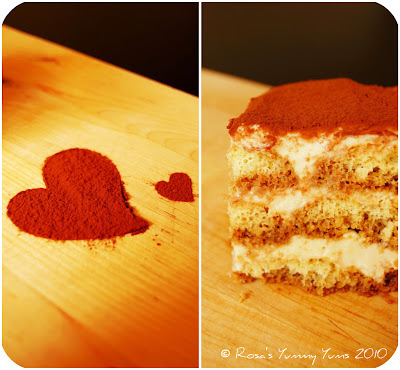 Step by step pictures for making Tiramisù (including zabaglione & pastry cream). Gluten Free Ladyfingers - 1000 gluten-free recipes by Carol Fenster (ladyfingers pg 436, Tiramisu pg 651). Gluten free Ladyfingers & Tiramisù. 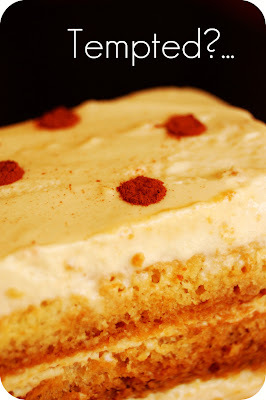 Diary Free Tiramisu - Levana Cooks Diary-Free by Lévana Kirschenbaum, Menachem Adelman, Meir Pliskin (pg 86). These are not for the recipe given for this challenge, but the procedure in the video would be a helpful guide. Etant donné la longueur du texte original, je n'ai malheureusement pas pu faire une traduction française de ce billet et je m'en excuse auprès de tous mes amis lecteurs et blogueurs francophones! C'est pourquoi je vous suggère de vous rendre sur le blog mentionné ci-dessous. Vous y trouverez cette recette en version française. From Sunday, February 21 to Sunday, February 28th, BloggerAid Changing the Face of Famine (BA-CFF) will be launching H2Ope for Haiti, an online raffle to raise funds for Concern Worldwide's relief effort in Haiti. Concern Worldwide estimates that its initial response to the emergency will last at least six months. In the coming weeks, Concern Worldwide’s priorities are to: Initiate a cash-for-work cleanup campaign to help victims of the earthquake earn a basic living - Build temporary latrines for 15,000 people - Provide temporary shelter (tents and plastic sheeting) for 25,000 people - Set up 7 outreach nutrition centres in camps for displaced persons, especially children under the age of one. What can you do to help in some small way to finance Haiti’s recovery process? 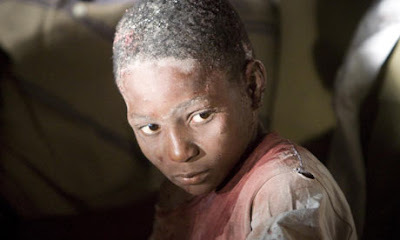 1) Go to the Justgiving donation page at www.justgiving.com/h2ope4haiti and follow the instructions on how to win. You will find the list of great raffle prizes donated such as an I-Pod Shuffle, artwork, autographed cookbooks and so much more!!! You can also see the list of prizes on Cooksister at www.cooksister.com/2010/02/h2ope-for-haiti-the-prizes.html. 2) Choose which prize you would love to win! The money raised by this raffle will be paid directly into a Justgiving page (http://www.justgiving.com/), meaning that nobody at BA-CFF will have any money their possession - the money gets paid directly into the charity's account, to be applied exclusively to the Haiti relief effort. This is the most secure and least controversial way to do it, even if it attracts a 7.5% fee. The other benefit of Justgiving is that they accept credit cards, debit cards and Paypal as payment methods, making it as easy as possible for people all over the world to donate and participate. 3) You can also donate a prize for the raffle. Bloggeraid is trying to make this raffle as international as possible, so they would like to confine the prizes to things that could be shipped anywhere with ease (books, original art or photographs, art, vouchers for online stores) – please, no food parcels or restaurant vouchers that are difficult to post or confined to one city. They also ask that the value of the prize you donate be at least $30 (£25), and that you take responsibility for paying for and arranging shipping to the winner at the end of the raffle. Final deadline for prize donations is Friday 19 February – please contact Jeanne at emailcooksister (AT)googlemail (DOT) com, or Val and Giz at blogs4famine(AT)gmail(DOT)com if you can help. The scent of the place, it's incomparable atmosphere entwined with a long as well as tragic history of slavery and French bourgeoisie, it's fascinating old houses as well as it's musical background and vibrantly exotic exhuberance are all so well described in the writings of Anne Rice. For all those reasons, for me, New Orleans is synonymous with mystery, eery religious practices, good food, romantism as well as cheerfulness. It is a destination that makes me fanticize. "The doctor had never been inside an antebellum mansion until that spring in New Orleans. And the old house really did have white fluted columns on the front...Greek Revival style they call it -- a long violet-gray town house on a dark shady corner in the Garden District, it's front gate guarded it seemed by two enormous oaks. The iron lace railings were made in a rose pattern and much festooned with vines; purple wisteria, the yellow Virginia creeper and bougainvillea of a dark, incandescent pink....Always he paused at the largest tree that had lifted the iron fence with its bulbous roots. He could not have gotten his arms around the trunk of it. It reached all the way from the pavement to the house itself, twisted limbs clawing at the shuttered windows beyond the banisters, leaves enmeshed with the flowering vines." I also remember that, while reading the Mayfair Witches chronicles, her tales about Mardi Gras transported me entirely . It is no wonder if, when flipping through my Culinaria "The United Staes: a Culinary Discovery" cookbook, my attention was drawn towards that buoyantly colored brioche bread that is only made during the period which follows Three Kings Day or the Epiphany (6th of January) and ends with Mardi Gras Day or Fat Tuesday (around the middle of February). This treat comes in various styles (simple ring, three-braided ring, four-braided ring, etc...) and with many different fillings (cream cheese, praline, apple, raspberry & cream cheese, chocolate, pecan, etc...). 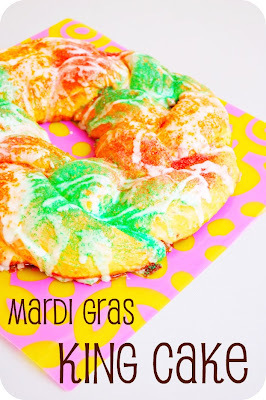 While the common "King Cake" is baked in an oven, the Cajun version is deep-fried just like a doughnut would be. 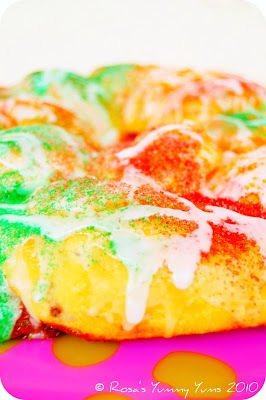 "King Cakes" are always topped with sugar granules in the official Carnival colors of purple (passion of Christ), green (hope) and gold (rewards of leading a Christian life). A small plastic baby is hidden inside and it has become customary in the New Orleans culture that whoever finds the trinket must provide the next "King Cake". After never really getting round to making a "King Cake", this year, I finally decided to overcome my ungrounded fears and baked that Louisiana-style delicacy with much success. Needless to say that although it took me two days to make, it disappeared in an even shorter lapse of time! 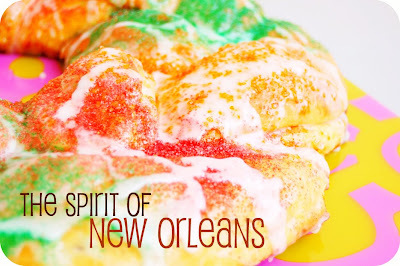 This New Orleans sinfully sweet carnival treat is so marvelous and festive that you can't get your hands off it! There is nothing better than a fresh slice of fragrantly yeasty brioche bread which's ooey gooey heart releases the most delightful flavors of cinnamon, roasted pecans, whiskey and is is covered with a crispy, yet melty layer of icing. Irresistible! 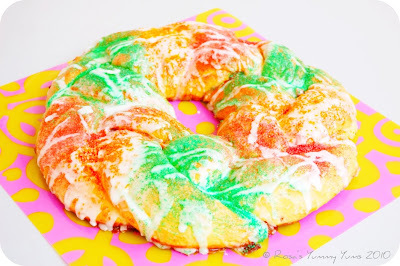 For those who are interested in learning a little more about the history and traditions of Mardi Gras "King Cake", I invite you to check out the following links: King Cake - A Rich Tradition, History Of the King Cake & Mardi Gras King Cakes. 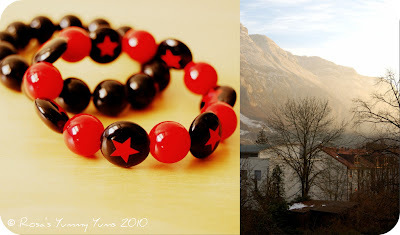 In Switzerland, the Catholic cantons also celebrate the carnival. The following videos and article might give you an insight: Saveur Magazine - Basel Carnival, The Morgenstreich - Basel Carnival, The Lights Go Out - Basel Carnival & The Tschäggättä - In Lötschental, Wallis (see my article on the subject). This post is also for YeastSpotting. Recipe taken from Food Network and slightly adapted by Rosa @ Rosa's Yummy Yums 2010. 1. Heat the milk in a saucepan until scalding; transfer to a food processor, add the yeast and pulse to combine. 2. Add 1/2 cup flour and the egg yolks; process to combine. Pour the remaining 2 cups flour evenly over the yeast mixture; do not process. Put the lid on; set aside for 90 minutes. 3. Add the 2 whole eggs, granulated sugar, lemon zest, salt and nutmeg to the food processor; process to make a slightly textured dough, about 1 minute. 4. With the machine running, slowly add the butter to make a smooth, sticky dough. once the butter has been incorporate, stop mixing. 5. Transfer the dough to a lightly buttered bowl and cover tightly with plastic wrap; let rise in a warm place for 3 hours. 6. Turn the dough out onto a clean surface and knead briefly; form into a ball and return to the bowl. Cover tightly with plastic wrap and refrigerate for 8 hours or overnight. 1. Plump the raisins in the bourbon in a small saucepan over medium heat. Remove from the heat and add the brown sugar, pecans, vanilla, cinnamon, orange zest, salt and the bean or plastic baby; mix until combined and set aside. 2. On a floured surface, roll the dough into a 20-by-7-inch rectangle, with the long edge facing you. Spoon the filling in an even layer over the dough, leaving a 1-inch border along the top and bottom. Fold the bottom and then the top edge over the filling to make a tight roll; pinch to seal. 4. Cover loosely with plastic wrap and set aside in a warm place until the roll doubles in size, about 2 hours. 5. Preheat the oven to 350 degrees. Bake the cake until firm and golden brown, about 40 minutes. Cool on a rack. 1. Mix 6 tablespoons water with the confectioners' sugar; brush 2/3 of the glaze over the cake. 2. 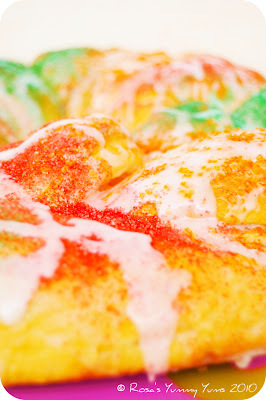 Sprinkle with bands of colored sugar; drizzle with more glaze. Instead of preparing a cake that is made with a single roll, I made three little rolls and braided them before my cake into a crown (see video). This cake is to be enjoyed without moderation, at any time of the day or night. 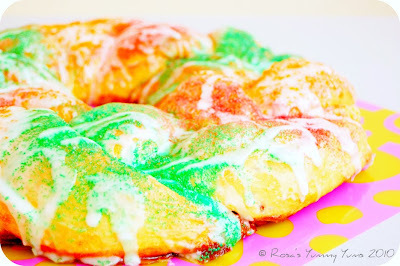 It is better to eat your "King Cake" quite rapidly (I guess that'll not be a problem as it might very well not make it to the next day LOL), otherwise it might dry up and loose it's moisture. 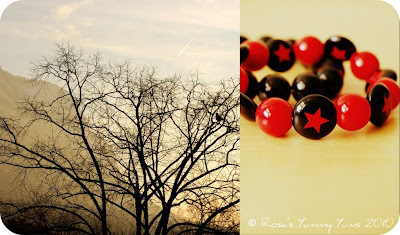 Recette prise sur le site Food Network et adaptée par Rosa @ Rosa's Yummy Yums 2010. 1. Chauffer le lait dans une casserole afin qu'il soit à température du corps (pas plus). Le mettre dans le bol du mixer et ajouter la levure, puis bien mélanger. 2. Ajouter 70g de farine et les jaunes d'oeufs. Mélanger à l'aide de la spatule mélangeuse du mixer. Bien répartir sur le dessus le reste de la farine. Ne pas mélanger. Couvrir et laisser reposer pendant 90 minutes. 3. Ajouter les 2 oeufs entiers, le sucre cristallisé, le zeste de citron, le sel et la muscade. Mixer avec le crochet à pain pendant 1 minute. 4. Tout en continuant de pétrir la pâte, ajouter le beurre afin d'obtenir une pâte collante et lisse. Pétrir juste assez afin que le beurre soit incorporé. 5. Mettre la pâte dans un grand bol beurré et recouvrir avec du film plastique. Laisser lever dans un endroit chaud pendant 3 heures. 1. Mettre les raisins et le whisky dans une petite casserole, à feu moyen, afin de les réhydrater. Enlever la casserole du feu et ajouter le sucre brun, les noix, la vanille, la cannelle, le zeste d'orange, le sel et la fève. Bien mélanger et mettre de côté. 2. Sur une surface enfarinée, rouler la pâte afin d'obtenir un rectangle de 50 x 18cm (la pâte doit être face à vous en longueur). Disposer la garniture en laissant un bord de 2cm de chaque côté. Plier le partie inférieur en la rabattant vers le milieu et replier la partie supérieure dessus afin d'obtenir un beau boudin serré. Pincer afin de sceller. 3. Mettre le boudin (avec la commissure dessous) sur une plaque recouverte de papier sulfurisé et superposer les deux bouts afin d'obtenir une couronne. 4. Couvrir avec une feuille de plastique alimentaire et mettre de côté, pendant 2 heures ou jusqu'à ce que la couronne ait doublé de volume. 5. Préchauffer le four à 180° C. Cuire la brioche jusqu'à ce qu'elle sonne creux et soit dorée, environ 40 minutes. Laisser refroidir sur une grille. 1. Mélanger 6 cuillères à soupe d'eau avec le sucre en poudre. Glacer la brioche à l'aide d'un pinceau et garder une petite quantité pour la finition. 2. 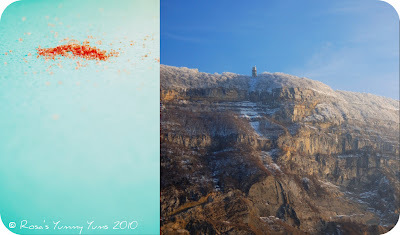 Saupoudrer avec le sucre coloré (faire des bandes distinctes). Faire couler le reste du glaçage sur le dessus du gâteau. J'ai formé trois boudins que j'ai tressé avant de former la couronne (voir vidéo). A manger sans modération, à n'importe quelle heure de la nuit et du jour. Il est préférable de consommer ce gâteau assez rapidemment (je ne pense pas que ça sera un problème) afin qu'il ne déssèche pas.